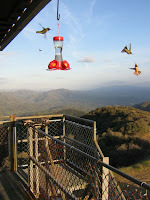 Actually, the hummers were the highlight of the trip. 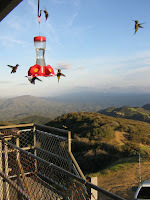 I hung the feeder Thursday morning; by late afternoon there were 15 or 20 birds competing for a perch. 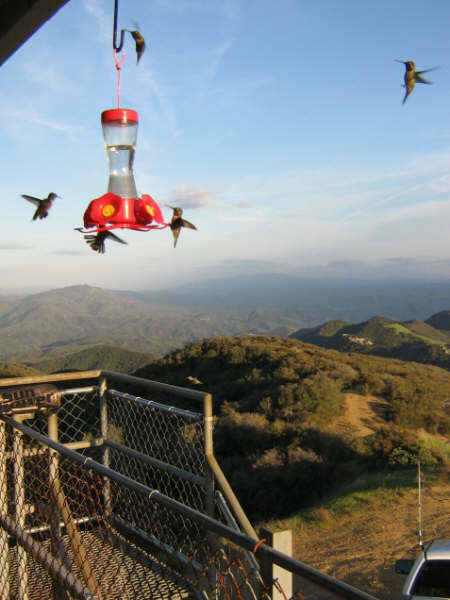 The great majority of the birds were Selasphorus spp. I saw two probable make Allen’s in the morning along with many Rufus, and maybe one or two female Black-chinned. At dush there was a frantic scrum involing 8 or 10 Rufus and 4 or 5 Anna’s. It was great to watch. I got a few photos with my little point & shoot digital camera, some from as near as 24″, maybe even a little closer. At one point I needed to move the feeder briefly, and 3 or 4 RUHUs came along with me, pecking at some orange lettering on my hat and trying to land on the feeder. Photos attached, for what they’re worth.